Neat, please keep me posted. BTW, I think I forgot to mention, this motor / fan combo I got is 3.85 oz., as for a 5oz car race, might be hard pressesd to make the 5oz. They will run my motor for about 35 secs which is too long. I'm trying to use up all available power in less than 5 secs. And that's why you improved it! Though i couldn't quite place my fingers on it! Looking back threw the back issues of your new's letters. I'm like Sporty on this. I'm amazed at the work you put into new's letters. Thank's for helping us out Randy. http://www.Digikey.com" target="_blank I don't know what there prices are like. Yeps I knoiw digi-key, use them all the time. BTW car ran by a stop watch 1.6 seconds, no other air powedered cars, so it was very fast compared to the other cars. But the speed also gave the car a beatin at the stop section, broken wheel towards the end, but took 1st place. and the zip tie actually broke on it from the hard hitting. Batteries dead but handled the race, almost to the very end, but even without the motor going in still won, due to the bearing wheels. 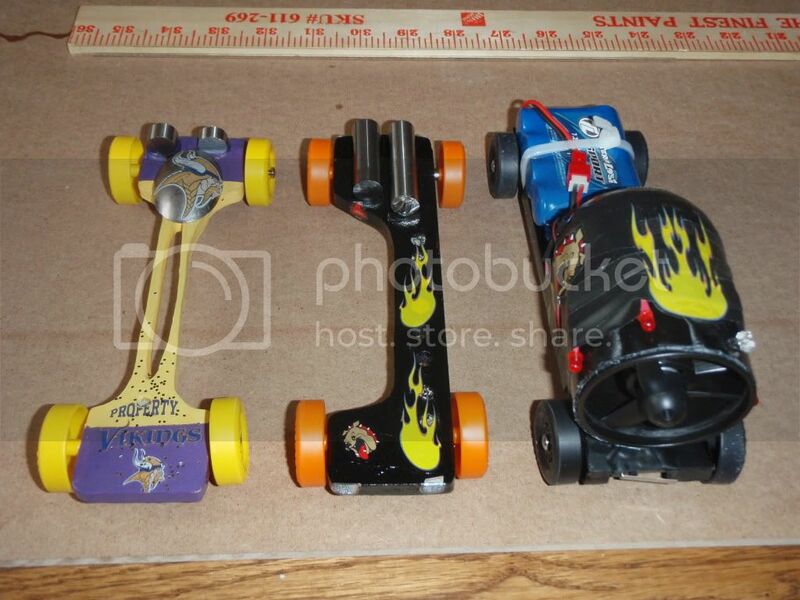 Just a few races it did with dead batteries, I think only two. They have a double elim race, so more races are run. sporty wrote: I used old style bsa wheels, to make razor type wheels, then drilled out for my bearings in the wheels. Thanks for the pics and specs! You mention bearings. What size axles did you use? It looks like they are needle axles. If they are needle axles, did you go with the 0.04 ID x 0.125 OD x 0.0469 W mini bearings, or did you use another setup? I used drill rod blanks for the axles. $2.00 each , I ordered through fastenal. The bearings I used were 5/32 o.d. I know this topic is almost a month old, but I thought I would weigh in. I made my first powered car and ran it in the outlaw division Saturday. I just used a cheap ducted fan (EDF50 from Grand wing systems) which only costs $11. I took a 7.2v li-ion battery pack out of one my old remote control cars and it was a great crowd pleaser. I even put led's on the front, and wired it up so that once the switch was on, the lights would come on, while still at the start gate, and then the fan would come on after the start gate dropped. The car weighed in at 8.6 oz (battery weighed 4.7) and I ran a 3 wheeler rr. I used an old waterbottle to make a shroud over the fan, which seemed to produce more thrust, but it was just by feel in the air coming out of it. The top speed for the pack was 2.194 (set by my son) and my car ran 1.74, and could go up the track when I tried it. It ran about 6 or 7 times and was still running great. This was on a 32' piantadosi wooden track. Here is a pic of my car (with my 2 cub's cars). The total investment in to the car was less than $24 (8 of that was the led's). Part of that was due to me already having the battery, however. 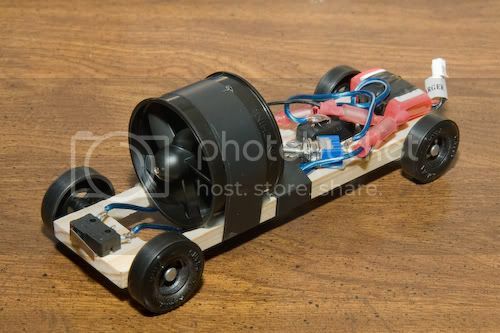 I have an air powered car built using the Max V kit. I run 2.2 gram wheels and get times of 2.0 on a 32' track. We had our derby last weekend and I ran it right at the end. The boys went wild with chants of "cheater, cheater, cheater"!!!!! Their was an audible gasp from the crowd when it went down the track. na its nice to hear about your air car and what you used. I like hearing about also any race on a 32' piantadosi track also. Thats what we run on at are pack. The 2.19 is decent time, id the set ups are the same. That was a good time for us in 2007/2008 with the old wheels. We been in the 2.14 and 2.15 range these past two years. There is two only my son and another family that I help each year that his that time, then a 3rd family will be 2.18 (I help this family out also), the rest in 2.20 to 2.21 range. Are rules are 4 on the ground, very mild cant only, really no cant, its so slight. and RR. I built this car for fun to see what it could do. It ended up weighing in at 4.7 oz and will fit in all the standard gauges. I ended up using a 7.4 volt Lipo battery but at some point I plan to play around with capacitors to bump that voltage up some. I ran out of time so the wheels and axles have no preparation on them. Only thing I did was put some graphite on them. All four wheels are on the ground. We have a 35 foot Besttrack. The fastest run on this track has been 2.52. The fastest the fan car has run is 1.60. A bit more work on the axles and using some capacitors and I am hoping for 1.5. I thought you all would be interested in more information on my car; the one Randy profiled in the capacitor/fan car article. I used the same fan Randy sells on my car, but I figured out how to provide it full rated Voltage and current. I looked at 9 Volt batteries and thought; what I really need is something that I can get ALL the energy out of in a couple of seconds. So, used a pair of supercapacitors in series to make a 1.5 Farad capacitor rated for 11 Volts. Keep in mind that most supercapacitors aren’t rated for this large a current (5 Amps) and most have a MUCH higher internal resistance. I built a little box to charge it to 10 Volts before the race; it had two 9 Volt batteries in series and a 10 volt linear regulator. A simple microswitch turns the motor on. The whole charge is used up in about 4 seconds, with the fan current ramping down from 5 amps to zero. With this much current, the car can literally fly; the thrust to weight ratio is 1.6! By the way, I tested the thrust with and without an extension tube, and the extension tube significantly reduced the thrust. I have data if you are interested. On our track my fastest time was 1.532 seconds for a 49 foot track! The other outlaw cars would barely reach the end of the slope when mine crossed the finish line! The average speed was 22 miles per hour; I don’t know what the actual finishing speed was. I found out that the wheels were decorative; the last three races were run with three bend axles and only three wheels. Next year I will have some sort of backup guidance system One other annoying detail; the car wasn’t heavy enough to close the microswitch with our starting angle; I had to leave a lead sinker behind on the track to provide the additional push into the starting gate. I totally smoked a car using two fans and two 9 Volt Lithium cells; his was at the maximum weight of 16 ounces. Mine was under derby weight. Here’s the information on the capacitors. You solder the negative wire of one capacitor to the positive of the other. Then you hook the positive wire to the positive wire of the battery through a kill switch and the negative wire to the negative battery lead. Then you wire from the capacitors to the fan motor via the starting switch. The internal resistance of the battery limits the current delivered while you are charging the capacitors. If you want, you can put a 14 Ohm, 5 Watt resistor between the positive wire of the battery and the positive wire of the capacitor; this will limit the fan current after the capacitor discharges to keep from draining your battery while you wait. You would have to wait at least 40 to 60 seconds for charging the capacitors. An 80 Ohm 1 Watt resistor will also work if you are really patient; at least 4 minutes of charging time. However, I wouldn’t bother with this. I used a charging resistor in my initial tests, but I found it just slowed down charging, rather than improving anything. The 9 Volt battery has a fairly high internal resistance; looking at some data sheets I think it may be around 6 Ohms and certainly not less than 1 Ohm. Duracell says it’s impedance at 1kHz is 1.7 Ohms, but I’m sure it can’t supply 5.3 Amps short circuit current http://www1.duracell.com/oem/Pdf/new/MN1604_US_CT.pdf" target="_blank . Here’s a link showing a Lithium 9 Volt starting at 3 Amps and falling to 1 Amp after 1 minute. http://www.batterymart.com/images/u9vl-charts_lg.gif" target="_blank Here’s discharge curves for an assortment of 9V batteries: http://www.powerstream.com/9V-Alkaline-tests.htm" target="_blank. These curves imply that the internal resistance is around 1 Ohm to start with and increases to something like 3 Ohms pretty quickly. I plan to run it at not less than 11.1 Volts/ 10.3 Amps, and I might raise the voltage to get 12 Amps, as the box says you can do a burst up to about 12 Volts (4 LiPo cells). The idea is to pull all the energy out of the capacitor bank as quickly as possible and eliminate the rapidly falling off thrust due to the capacitor voltage dropping.